Who was Maria Becket and why do so many celebrate her memory? Maria died in Athens on October 29, 2012. Requiem for Maria, 2nd November, 8am, St Paul's Cathedral, London. A very moving memorial service was held on the afternoon of December 8th at the Church of Aghios Nikolaos Ragavas attended by an overflowing crowd come to mourn and honor Maria. Four brief talks were given, Marianna Koromila, Theodor Papalexopoulos, Selcuk Erez and the final one by former Prime Minister Costas Mitsotakis which was much commented on given its warmth and his willingness to address the charges leveled against Maria. The talks can be found on site 'memorial' page. After the service a film of Maria put together by Jim Whitney was shown and is available here on the website. Listen to audio below where Maria talks of her life and how memories remain beyond the grave. Maria and James Becket on their way to the Court of Human Rights in Strasbourg. 'We die twice, once with our last breath and once when our name is last spoken by someone who knew us'. An obituary by author and historian Neal Ascherson, a close friend of Maria's and an important figure in the success of RSE symposia. Maria Becket, who has died in Athens at the age of 81, was a lifelong fighter for justice and sanity. Sometimes she fought by persuasion, as when she organised a decade of ‘symposium’ voyages to confront the international elite with the growing threat to the world’s waters. But sometimes, above all in resistance to the Greek military dictatorship between 1967 and 1974, she took part in clandestine struggle, including the smuggling of explosives. It was hard to believe that this dignified lady bore on one leg the scar of a grenade ill-thrown during guerrilla training in Syria. As a child during the Nazi occupation, she carried resistance leaflets across starving Athens in her doll’s pram, and once opened the front door to find a dead girl her own age huddled on the step. ‘Why her? Why not me?’ was her first political thought. Her father Nikolaos Chary, a famous civil engineer, was involved in resistance, but his experiences in the horrific civil war which followed the occupation eventually drove him to suicide. Maria came to fear his violent and authoritarian behaviour. Her mother’s family was very different. The Dzelepys came from Constantinople; their Greece was the lost Hellenic world of the Byzantine Empire, and the blood of the imperial Palaeologos dynasty ran in their veins. The family were at first shocked when Maria married an American, the radical film-maker Jim Becket. But when their daughter Sandra was born, on August 15, 1961, the Dzelepys’ hearts melted: it was 700 years to the very day since their ancestor Michael Palaeologos had recaptured Byzantium from the Venetians. Maria was a schoolgirl on holiday when she met Count Folke Bernadotte on the island of Rhodes. It was 1948, and the Count – UN mediator in Palestine – was to be murdered by Zionist gunmen only a few weeks later. But they had time to become friends, and his answers to her impatient questions about the fate of the Palestinians later served her well. For a time, Maria seemed to be entering a conventional life. She did a doctorate in London, married Jim Becket and became the mother of two little girls. But then, in April 1967, a clique of right-wing officers and politicians overthrew democracy in Greece. Censorship, mass arrests and torture followed. It was now that Maria Becket discovered her two great political talents: for persuasion and for clandestine organisation She became a familiar figure at the United Nations as she lobbied tirelessly against recognition or acceptance of the Greek dictatorship. In 1969, the evidence of torture produced by Maria through victims she had smuggled out of Greece secured the expulsion of Greece from the Council of Europe. In secret, she organised the smuggling of arms and explosives to the resistance inside Greece. She persuaded Yasser Arafat, Palestinian leader, to offer Greek partisans weapons training in his Syrian camps. Maria was in Damascus in July 1974 when the junta launched its disastrous coup in Cyprus, leading to the flight of Archbishop Makarios, the Turkish seizure of half the island and the collapse of the junta itself. With Palestinian help, Maria set up ‘Radio Free Cyprus’ in an olive grove near Beirut and broadcast messages from Makarios to reassure his followers that he was still alive. Soon she was back in Cyprus organising international aid for the flood of Greek refugees fleeing from the Turks. Democracy returned to Athens, but Maria turned down an offer to become Greece’s ambassador to the United States. Instead, she used resources left over from the anti-junta campaign to rescue Turkish dissidents opposing their own government. In the later part of her life, Maria took up the cause of the world’s waters against the ‘new apocalypse’ of pollution and exploitation. 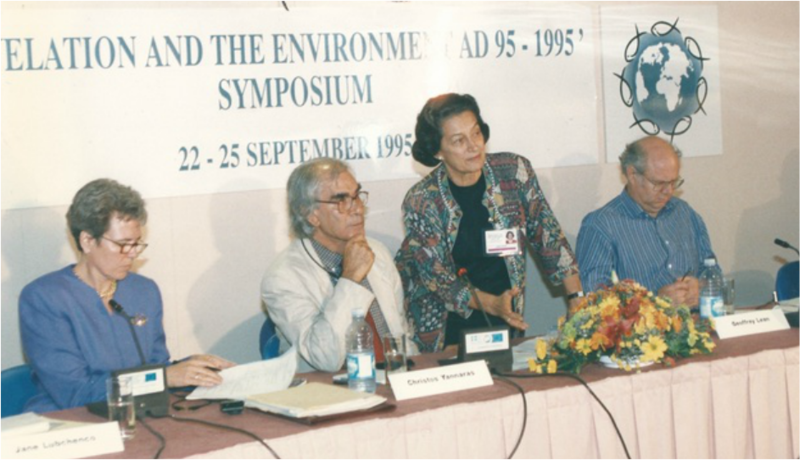 In 1995 she organised the first of eight hugely ambitious ‘symposium’ voyages, carrying ecologists, clerics of all creeds, bankers, EU Commissioners and environmental commentators on chartered ships to study a threatened sea or river. Formalised as the London based organisation ‘Religion, Science and the Environment' organised symposia in the Aegean, the Black Sea, the Danube, the Adriatic, the Baltic, the Amazon, the Greenland Arctic and the Mississippi Delta. Maria was working on a Ganges Symposium during her final illness. The patron of RSE was Bartholomew I, the Ecumenical Patriarch of Constantinople and formally the senior prelate of the Orthodox churches. Within a few years, his enthusiasm for ‘the natural creation’ had earned him the media title of ‘The Green Patriarch’. But while the credit for recruiting and promoting him lies with Maria, her motives may have been as much political as pious. The Dzelepy family had always been loyal to the Constantinople Patriarchs because they were the last authentic Byzantine officials. Maria may have hoped not only to strengthen Bartholomew’s position in Turkish Istanbul, but through him to unite the whole Orthodox world community in action to save the environment. From her London flat, Maria Becket carried the burden of organising the symposia almost single-handed. She began life as a rich woman, but as the banking crisis discouraged donors, she began to spend her own money. By the time of her final illness, she was almost penniless. It was a cruel irony that as she lay dying, panicky Greek authorities accused her and her family of using the symposia to defraud the State and subsequently of money-laundering. She was imperious. One glance from her huge black eyes could bring a noisy room to order; in constant pain from a scoliosis which made her limp, she was both physically and morally courageous. An outer darkness of scorn awaited those who disappointed her. She could allow herself to be warm, tender and often very funny with those closest to her, especially her daughters Sandra and Daphne and her beloved granddaughter Sofia. But Maria ultimately set duty above personal happiness, and through her bold acts and inflexible persistence she left the world a cleaner place. 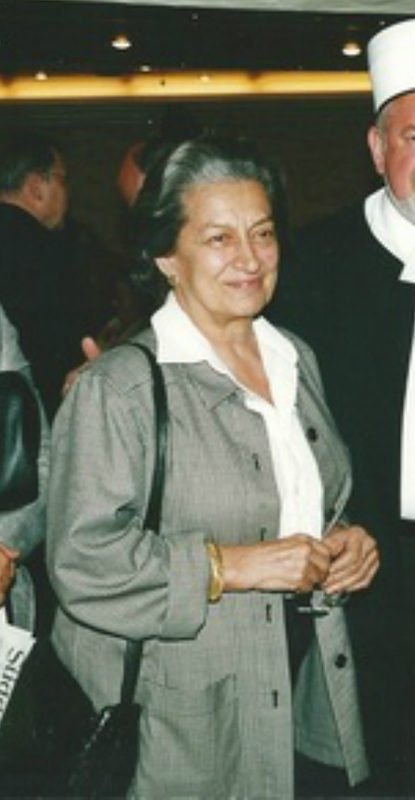 Maria Becket, born in Athens April 7th, 1931; died in Athens October 29th, 2012. In Paris in late 1969, when junta foreign minister Pipinelis walked out of the Council of Europe meeting to avoid the junta’s imminent expulsion, a single figure stood at the top of the stairs. As he passed he hissed, ‘you will pay for this, this is your fault’. And that was in large measure true. That person was Maria Becket. It was she who had worked over two years with the three Scandinavian governments to bring the Greek Case before the European Human Rights Commission. And it was she who had organized the escape of torture victims from Greece to appear before the commission in Strasbourg. The commission found Greece guilty of human rights violations, notably the systematic use of torture. The Bouboulinas Street torture center became notorious (ironically named for a woman hero of another Greek liberation struggle). Reacting on that fateful day of April 21, 1967, she had naively sent a telegram protesting the military coup. By the time the junta fell in 1974 she had covered the entire range of political actions from words to supplying resistance movements inside Greece. The constant travel to Scandinavia, to the training camps of the Middle East, to her own clandestine trips into Greece, to developing media and political relations, she personified the behind the scenes, selfless struggle for democracy in her native land. As a child she had lived through Metaxas’s 'Oxi', through the occupation when one morning she found the starved body of a girl her own age on their doorstep. This memory would always haunt her as why was it this child and not she. Her father was on the Communists’ death list and when EAM ELAS occupied Athens, he hid waist deep in water in a Pangrati kitchen. When he came out his hair was totally white. He would suffer a persecution mania so extreme it culminated with him attempting to strangle Maria, the one person he would let close. Released after shock treatment, he committed suicide. In the 50’s and early 60’s she received a Phd in Byzantine History from London University, married and had two children. 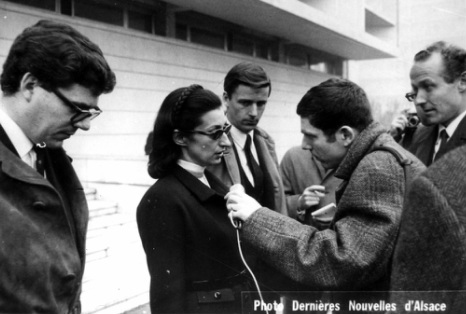 Living in Geneva in 1967, her life became that of a militant battling for the restoration of democracy in Greece. She made important contacts with governments, the media, and liberation movements around the world. 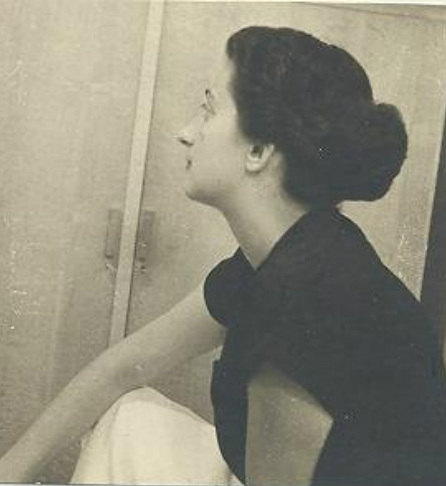 When the junta overthrew Makarios in Cyprus, she set up a radio station outside Beirut, Voice of Free Cyprus, broadcasting Makarios’s own voice proving he was alive. Arafat offered through her to send 4000 troops to Cyprus to defend Makarios, but the Archbishop turned the offer down and took his case to the UN in New York. When the junta fell, Karamanlis offered her the post of Ambassador to the US. She turned it down as she had every other similar offer. She never had any political ambitions, she was her own person, always shunning publicity, so few knew what she had achieved. Especially when others, particularly politicians, were only too willing to write their own self-serving versions of history. In the last years of her life she turned all her energy and all her inherited wealth to the cause of the environment. Working with the Ecumenical Patriarch Bartholomew of Constantinople, she organized, raised the money and ran eight successful symposia bringing together scientists and religious leaders to find solutions for our overtaxed planet centering on water. Symposia were held not in a city but on the body of water whether in the Arctic or the Amazon or the Aegean or the Adriatic. Her mother’s side of the family was from Constantinople and she always felt an obligation that an ancestor had let the invaders into the besieged city in 1453. True or not, she wanted to strengthen the Patriarchate’s precarious position in this now Turkish city. It was through these symposia and thus through Maria’s efforts that Bartholomew achieved international stature as “The Green Patriarch’. Maria was never one interested in power or wealth, and in a culture that celebrated the powerful and the wealthy, she was different, and that allowed her to always be her own self. A self that overcame so many obstacles to achieve so much and affect positively so many lives. The following is a translation from the Greek speech. Maria Becket belonged to this rare breed of human beings whose life is devoted to great, noble causes for which they are ready to sacrifice everything. This is what happened with Maria during the seven year junta. Nothing had prepared her for the part she was to play. Born a daughter of a bourgeois Athenian family with no prior involvement in political life. married at the time with an American lawyer, living in Geneva with her two little daughters, she nevertheless became a protagonist and a central figure of the resistance against the junta outside Greece. In August 1968, being a fugitive, I left Greece in secrecy through Turkey and settled in France where I became Constantine Karamanlis’ closest collaborator. I came into contact with the resistance groups that were scattered all over Europe. It is then I came into contact with Maria Becket whom I did not know –my wife Marika who was her schoolmate had talked to me about her- and I worked closely with her throughout the dictatorship years. Maria had good relationships, was prepared to work with and help everybody. She was the expression of the spirit that reigned then among us, which was that even when we disagreed politically, we were a united front against the junta. Our first big success was in the autumn of 1968, it was the battle we fought in Strasbourg to have the junta ejected from the Council of Europe. That battle was won. It was a hard battle, without means, under difficult conditions, but we were united and we had faith and enthusiasm. We were all gathered there and Maria was our helper, she who had the major role and privileged connections and relationships with the Scandinavians who had started this effort on a governmental level. Andreas Papandreou whom I hadn’ t met since the eve of the 15th of July 1965 during the Apostate crisis also came to Strasbourg, Maria asked me whether I was willing to meet him and of course I agreed to. She locked us in a hotel room in Strasbourg, we discussed the whole night through, agreed on everything, but the next day Papandreou denied our agreement. Papandreou left alone, determined to follow his isolated course to the end. Our effort was political, but the resistance part of it was focused on helping those in Greece who were fighting from within the country and had to be rescued out of Greece. Maria with the help of many devoted friends had organized an effective rescue network working with forged passports. Elias Kulukundis one of the leaders of this effort describes the escape of the political prisoner Giorgos Mylonas from the island of Amorgos, in the book that was published just recently. Maria was highly esteemed and trusted by everyone. She had inborn bravery, intelligence, wit and above all a will of steel and perseverance. When she was given a mission she would do all that is humanly possible to carry it through. After the fall of the dictatorship, Maria went back to her private life, silently and in modesty. She never asked for any award or recognition. She did not want to get involved in Greece’s internal politics. The only exception was when I took over the presidency of the New Democracy Party in the very difficult elections of 1985 and asked her to help by participating in the committee for the electoral campaign I had just founded under the presidency of Stephanos Manos. Her contribution was very important. Her other great passion, in the last phase of her life, was environmental protection, humanity’s major existential problem today. She committed herself totally, with youthful enthusiasm. 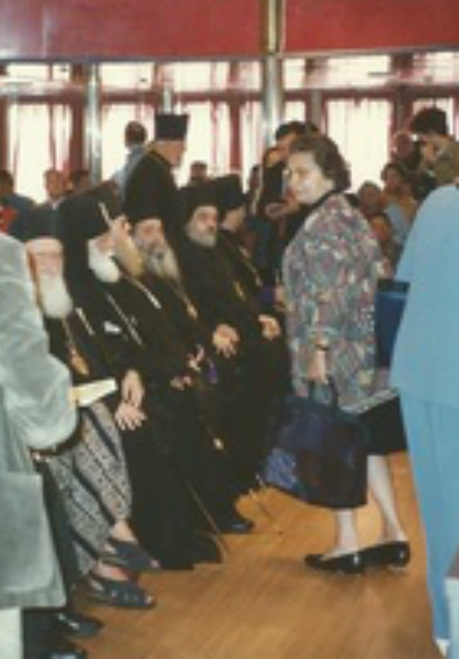 She helped the Ecumenical Patriarchate to upgrade and get international recognition through its involvement with the environment. She crossed the globe, organizing symposia in the most remote and inaccessible parts of the planet. She totally and utterly committed herself to this great cause. Fate unfortunately kept a cruel end for Maria. She was accused of fund mismanagement, and the bitterness it caused her probably accelerated her death. I cannot speak of things that I do not know of, but there is one thing I feel the duty to declare, with a clear conscience and a clear heart: The Maria we all knew offered all she had for what she believed in and fought for, even at the expense of her children. She never asked and never got anything in exchange. We your old companions who salute you today, will remember you with love and will honor your memory. Your daughters and granddaughter can be proud of you. Η Μαρία Μπέκετ ήταν μια Ελληνίδα και ταυτόχρονα μια Πολίτης του Κόσμου με την ιδανικότερη έννοια αυτών των όρων. Επίμονη πάντοτε στους στόχους της, αυστηρή πρώτα με τον εαυτό της και μετά με τους γύρω της, ανυποχώρητη στις απόψεις της για τις αξίες που όχι απλώς πίστευε αλλά σιωπηλά και με αυτοθυσία υπηρετούσε, ήταν φάρος για όσους ήταν τριγύρω της και καταφύγιο για όποιον είχε την ανάγκη της. Η ανιδιοτέλεια ήταν απο τα κύρια και συγχρόνως τα πιο δυσνόητα, για όλους, χαρακτηριστικά της. Κανείς δεν μπορούσε να πιστέψει οτι η Μαρία ό,τι έκανε το κατέθετε πάντοτε σε κοινή ωφέλεια. Μόνο όσοι τη γνωρίζαμε καλά, ξέραμε οτι η Μαρία Μπέκετ είχε αφιερώσει όλες της τις δυνάμεις, βιολογικές και υλικές, για τους Αλλους. Η ίδια είχε ελάχιστες ανάγκες και ακόμη λιγότερο τις ικανοποιούσε. Η Μαρία, όπως όλοι οι Σημαντικοί αυτού του Τόπου δεν είχε το τέλος που της άξιζε. Τούτο γιατί της έλειπε μια σπουδαία "αρετή". Η ικανότητα να υπερασπίζεται τον εαυτό της. Αυτή η καταπληκτική γυναίκα που υπερασπίστηκε εκατοντάδες ανθρώπους και πάμπολλες αξίες στη ζωή της, δεν μπορούσε - γιατί δεν ήθελε - να υπερασπιστεί τον εαυτό της. Ετσι όταν το ελληνικό κράτος την κατηγόρησε για κακοδιαχείριση των πόρων του ΜΚΟ που ή ίδια έστησε και εν πολλοίς χρηματοδότησε για τη Διεθνή προβολή του Οικουμενικού Πατριαρχείου, εκείνη αρνήθηκε να αποδείξει την αθωώτητα της και προτίμησε να θέσει τη ζωή της σε ιλιγγιώδη αντίστροφη μέτρηση, αρνούμενη ,σχεδόν, να δεχθεί τροφή επι εξάμηνο, ενώ ο καρκίνος μέσα σε δυο μήνες ολοκλήρωσε το έργο του κράτους.